Following on from my April post regarding thoughts about Person Health Records, I’ve been working with Professor Dipak Kalra to clarify the definitions and purpose of PHRs. This work is intended to be part of a much larger document which describes PHRs and provides examples. Personal Health Records are by their very nature hard to define and in order to tease out the breadth and depth of PHRs, it may be helpful to consider PHRs and clinical EHRs being positioned at two opposing ends of a spectrum of health records (see diagram). We could attempt to define a PHR as the direct counterpoint to an Electronic Health Record, but in practice the lines of demarcation are most often not clear nor desirable, except when viewed in terms of who has control over the health record and the content within. While EHRs have traditionally been defined as “logical representations of information regarding or relevant to the health of a subject of care”, they have existed primarily for the purposes of the healthcare provider providing care to an individual. Information from EHRs may be made available to the subject of care or their authorised representative, upon request to the clinician who is acting as a steward of the health information. In some countries this is supported by specific legislation. PHRs are also “logical representation of information regarding or relevant to the health of a subject of care”, however in the strictest sense these health records are primarily managed and controlled by the individual who is subject of care, or their authorised representative. The individual has rights over the clinical content held within a PHR, including the ability to delegate those rights to others, especially in the case of minors, the elderly or the disabled. The individual, or their authorised representative, is the key stake-holder determining that the content of the PHR is relevant and appropriate. Simplest examples include self-contained mobile phone applications that track a personal diet or exercise history – individual controlled and accessed only by the individual themselves. However, in between these two strictest views of an EHR and a PHR is a continuum of person-centric health records with varying degrees of control, access and participation by the individual and their healthcare providers. Toward the EHR end of the spectrum, some EHRs provide viewing access or annotation by the individual to some or all of the clinician’s EHR notes. Conversely, at the other end of the continuum, some PHRs enable individuals to allow varying degrees of participation by authorised clinicians to their health information – from simple viewing of data through to write access to part or all of the PHR. In the middle range of this continuum exist a growing plethora of person-centric health records that operate under collaborative models, combining content from individuals and healthcare providers under agreed terms and conditions depending on the purpose of the health record. 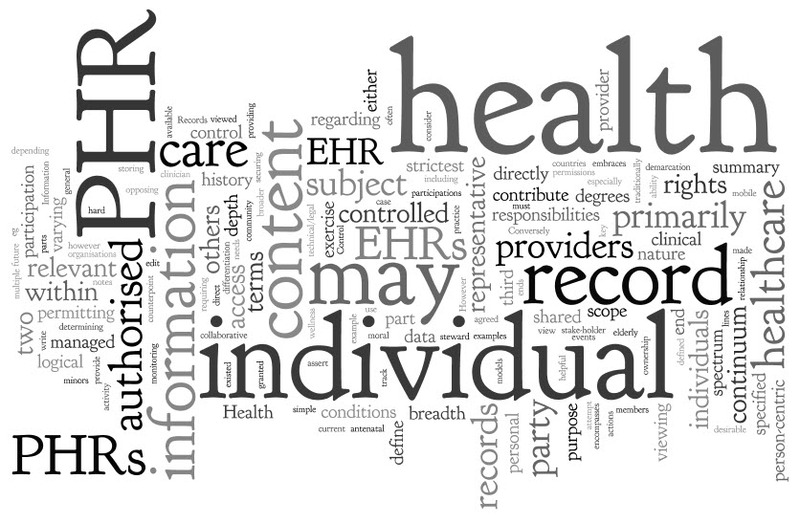 Control of the record may be shared, or parts controlled primarily by either the individual or the healthcare provider with specified permissions being granted to the other party. For example a shared antenatal record may be either primarily a PHR, under auspice of the individual, permitting authorised health care providers to contribute content or directly edit part of all of the record itself, or it may be an extension of an organisations EHR, permitting the individual to view or directly contribute content to some or all of the record. The exact nature of the sharing of responsibilities and participations by each party needs to be specified in the terms and conditions of the health record. Intent of health information with a PHR may be purely for use by the individual themselves or it may be used to share with healthcare providers and others, such as family members. Ownership of the PHR can be complicated – requiring differentiation between moral ownership of the health information content and technical/legal stewardship for storing and securing the data. Storage of health information upon a PHR platform that is managed by a third party requires a formal relationship between the two parties so that individuals can assert their rights, as must the third party uphold their responsibilities. The content scope for a PHR varies according to purpose, and is broader than most conventional EHRs. In the maximal scope a PHR may have a breadth that encompasses health, wellness, development, welfare and concerns; plus a chronological depth which embraces history of past events, actions and services; tracking and monitoring of current health or activities; and goals and plans for the future. Some PHRs will have a very general, summary focus; others may be activity-driven eg a diabetes management record within a Diabetes community portal or an personal fitness and exercise record. An individual may choose to have one single summary PHR or multiple activity driven PHRs, or a combination of both. We’re all pretty familiar now with the concepts of HealthVault and Google Health as PHRs. Then there is also PatientsLikeMe and PHRs sponsored by diabetes and other chronic condition organisations, and those proposed by your health insurer, and those on your phone that support you managing your weight, diet, fitness, blood pressure, glucose readings… the list goes on. Horses for courses. I spent a reasonable portion of my Easter break commenting on an evolving draft ISO technical report that is attempting to provide an authoritative view on the definition, scope and context of Personal Health Records (PHRs). Given that standards organizations are usually way behind the times, it is good to see that they are attempting to address these issues, but then again, there were over 200 PHR’s on the market back in 2000 when I did some market research – 10 years ago. Most are now defunct and we now have a new range of PHRs – most with better business models, not necessarily better functionality! So after observing the PHR evolution for some time now, my conclusion is that it appears to be getting significantly harder to define the PHR, rather than easier. It’s a bit of a mess really – most ‘definitions’ actually describe what a PHR might or can DO, not being brave enough to define exactly what it IS! This reflects the real difficulty in pinning down the concept of a personal health record as the domain is filled with huge variation in potential solutions: those aimed at supporting individual self management of health conditions, informed consumer decision-making and consumer entered health information; those evolving towards shared records and distributed healthcare in varying levels of collaboration with clinicians; and those providing constrained access for the individual to clinician EHRs – all complicated by varieties of input, control, ownership of content and access rules for individuals and clinicians. Some describe the individual merely as ‘a key stakeholder determining its content and with rights over that content’ – I find this problematic. Can the individual only be a stakeholder in a PHR – personally I think of the individual or the consumer or the patient as the absolute focus and the pivot point of a PHR – it is all about them AND it is all for them. All in all, I think that the number of disparate ‘definitions’/descriptions reflects the difficulty that comes from trying to define a concept that is hugely broad in scope and function, and is likely to evolve and increase in complexity over time. And these current definitions and descriptions certainly don’t reflect my current simple use of a number of different types of PHRs on my phone. The first being a ‘pure PHR’ which are usually self-contained applications where the individual owns, controls and maintains their health information (or delegates the control and maintenance to a trusted individual to operate on their behalf). 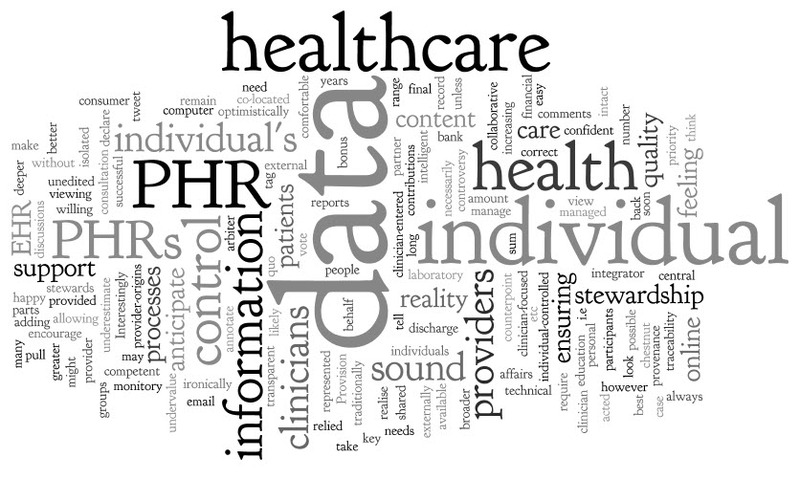 The ‘pure PHR’ can be viewed as the counterpoint to the clinician’s EHR – authored, managed and owned by the clinician (although with obligations to make that information available to the individual upon request). Thus, the ‘pure’ PHR could be defined relatively simply, encompassing the opposite end of the spectrum to the clinician’s formal EHR. There are so many examples of these applications. Many small self-contained ‘best of breed’ ones available on PCs or our phones tracking our weight and blood sugar, diet diaries – I have Weightbot, ShapeUp, and bant on my iPhone as examples. Some are integrators, offering a number of these applications in one place eg HealthVault. Still, the individual owns and manages it all on one platform. Then there are ‘the rest’ – which, for want of a better term, I will call the ‘hybrid health record’. These hybrid health records are proliferating at a great rate, and with many permutations and combinations with respect to the role of the individual and the clinician; how much health information is shared between parties; inclusion of third party content; ownership; who controls what, etc. This group of hybrid records are difficult to clearly define, but have the potential to transform the way we deliver health care in the next decade. This is where I believe that the ‘magic’ will happen – where we will really begin to make a difference in healthcare! At the EHR end of the hybrid spectrum will be EHRs with patient portals which will allow the individual to view some of the content with their clinician’s EHR. Towards the ‘pure’ PHR end of the hybrid spectrum will be primarily patient-managed records, allowing clinicians some limited rights or inclusion of their content. In the mid range will be health records that may evolve towards what we tend to think of as ‘shared health records’ or others with collaborative models combining content from individuals and clinicians under agreed terms and conditions. 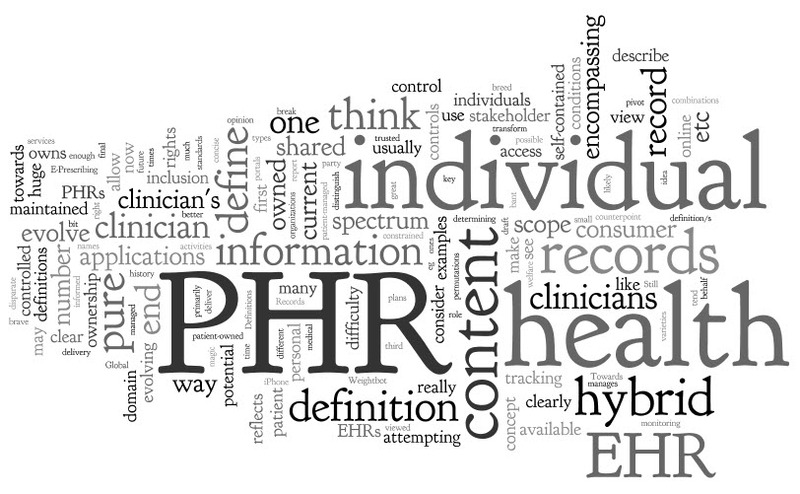 I think that it is possible to define the EHR and ‘pure’ PHR as clear end points, and then we can allow for the huge variability in between, the domain of the ‘hybrid’ record. These names I have used may not be right or final but use them to consider distinguish between the concepts for now. depth – encompassing history of past events, actions and services; tracking and monitoring current health or activities; and goals and plans for future.